When I was at school in London, a field trip to see the classic limestone scenery that is a standard part of the geography curriculum involved a major expedition: a week-long journey to the Craven district of Yorkshire where we had our first opportunity to see features described in our textbooks and on the blackboard for ourselves. Now, an inhabitant of northern England for over half my life, I can get to a miniature “Karst” landscape with a drive of under an hour drive from my home. Bollihope Burn rises on the moorland between Weardale and Teesdale, and looks like many other small tributaries of the Wear as the water tumbles through a series of riffles towards its confluence with the River Wear near Frosterley. As is the case for many streams in this area, there are spoil heaps and other relics of the lead mining industry close by the water and, were I to look closely, I am sure that I would see evidence for their malign effect on the ecology of the stream. A couple of kilometres above the confluence with the Wear there is, however, a rather more serious problem for the fish and other aquatic life: a complete absence of water. 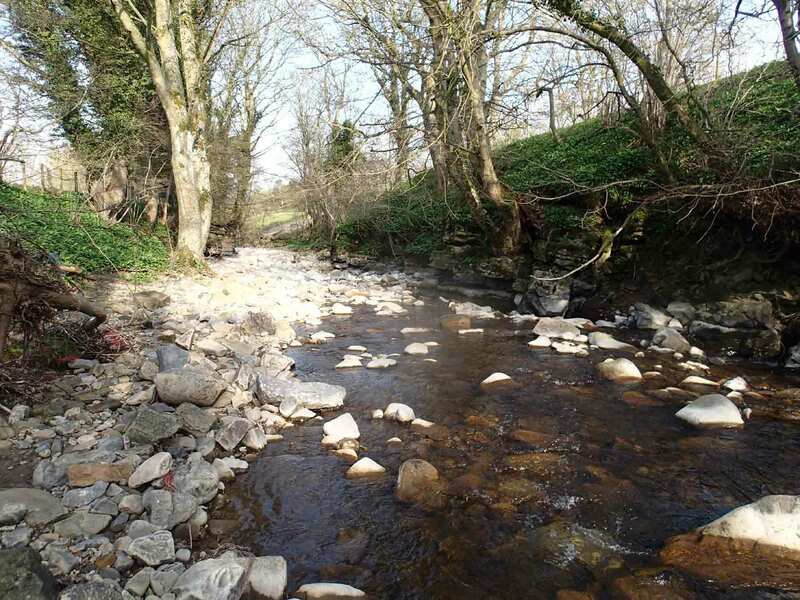 Scrabbling down the bank into the dry stream bed and walking upstream for a short distance, I can start to hear the sounds of a babbling brook again and, on turning a corner, see the stream as it disappears through a series of swallow holes. Bollihope Burn at approximately NZ 034 362, as it disappears down a swallow hole, with the dry river bed beyond. Walk a short distance downstream and more “Karst” landscape features are on display. The dry river channel continues over a waterfall and then in a steep gorge, which once was an underground cavern created as the water eroded away the limestone. 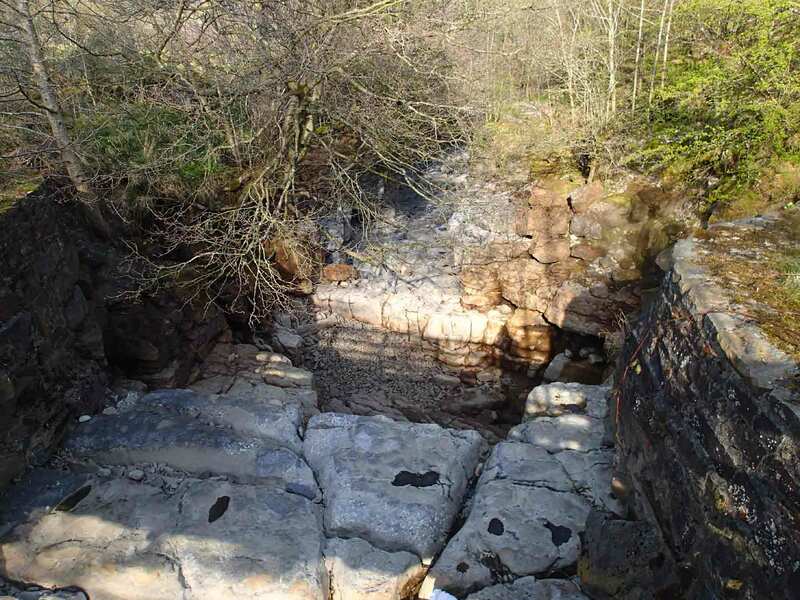 Just at the point where the stream should have tumbled over the waterfall, the limestone is darker and close examination reveals a patterning of lighter-coloured fossils. 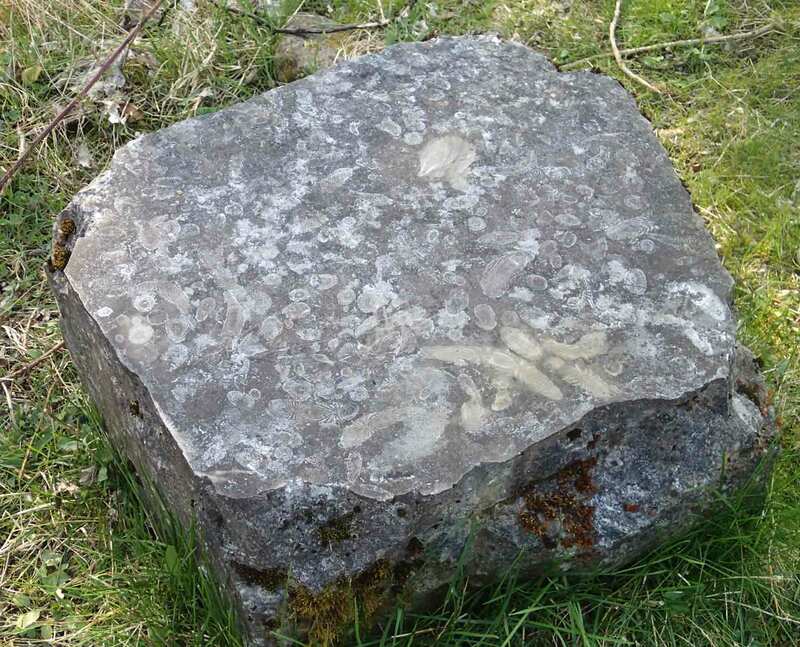 This is the famous but misnamed “Frosterley Marble”; it is, in fact, a dark-coloured variant of the Great Limestone that is common in the Pennines. The most prominent fossils in the rock are corals and crinoids, reminding us of the origin of these rocks in shallow, warm tropical seas of the Carboniferous period over 300 million years ago. Bollihope Burn showing the dry waterfall in the foreground and the collapsed cavern in the background. A polished block of Frosterley marble beside Bollihope Burn, April 2016. The fine grain of this particular means that it can be cut and polished to give the appearance of marble, although a geologist would reserve this word for particular metamorphic variants of limestone. 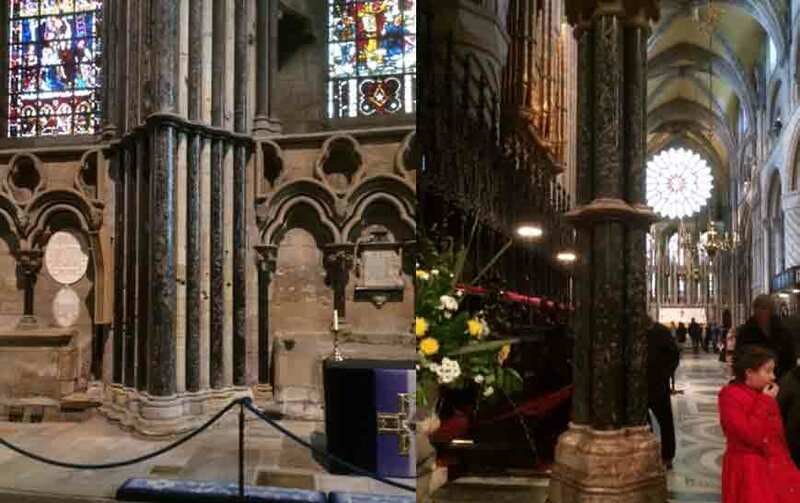 There is no true marble in northern England, and the Frosterley marble is a fine substitute, cropping up in several places including, most famously, Durham Cathedral, where columns (probably quarried from the bed of Bollihope Burn) support the roof of the Chapel of Nine Altars and the rood screen. Much great architecture (and certainly that which blends most sympathetically with the landscape) is really just a rearrangement of local geology. Pillars of Frosterley marble in Durham Cathedral. Left: in the Chapel of Nine Altars; right: part of the rood screen between the nave and choir. This entry was posted in Uncategorized and tagged Bollihope Burn, Durham Cathedral, Frosterley marble, Karst, limestone, swallow hole. Bookmark the permalink.